Being able to broadcast company news to employees is still one of the highest priority requirements that organizations place on an intranet. The Confluence-based social intranet suite Linchpin combines such classic management wishes with modern team collaboration. The Enterprise News Bundle app is used to implement your company's news strategy. Everyone can see news items in the news widgets (with the Cover Stories macro), users can browse through their individual news feeds, there are extensive personalization options and more. Our development team has just released Enterprise News Bundle version 2.2, which delivers greater flexibility and customization options, and enhances employee engagement with their intranet. Here are some of the new features. The obvious and striking new feature of the Enterprise News Bundle is the News Center, which allows companies to add an intranet portal that focuses exclusively on internal news. In contrast to the Cover Stories, which are integrated into the intranet's homepage and in where only the latest news is displayed, the News Center gives you an overview of all messages (either as tiled articles, similar to the Cover Stories macro or in a text-based layout). A major advantage in addition to the overview is that you can search specifically for historical news articles. The News Center has a search function that is limited to news items (and therefore much more convenient than the Confluence standard search). You can also filter your news search results: Show only news items from category A, only from author B, only from period XYZ, etc. It's perfect to use as a news archive - very similar to the archive on a magazine's website. Personalization and with that personal relevance - this is a key factor for user engagement and a permanently successful intranet. Linchpin enables such personalization on both a content and functional level, and plays a central role in enterprise news. There were previously only two types of news management: Users could actively compile their own news from the sources available on the intranet with their Personal News Feed. Alternatively, the intranet editors could control how news items displayed in a magazine-like format with Cover Stories, are broadcast to different user groups according to the users' profile attributes. In the second case, the personalization is done automatically, users don't have to do anything themselves. This has now changed: With Cover Stories, users can now actively subscribe to topics and compile news presented with Cover Stories in the same way as their Personal News Feed. 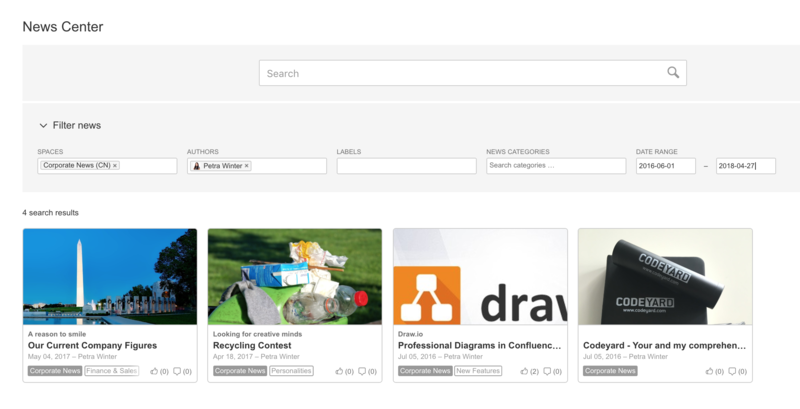 This lets users highly customize their intranet to suit their personal interests. (You can enable and disable this option in the macro, so you can continue to use Cover Stories in the traditional way. You cannot re-introduce an intranet for the first time. The little details that make life easier for new users, should not be underestimated. 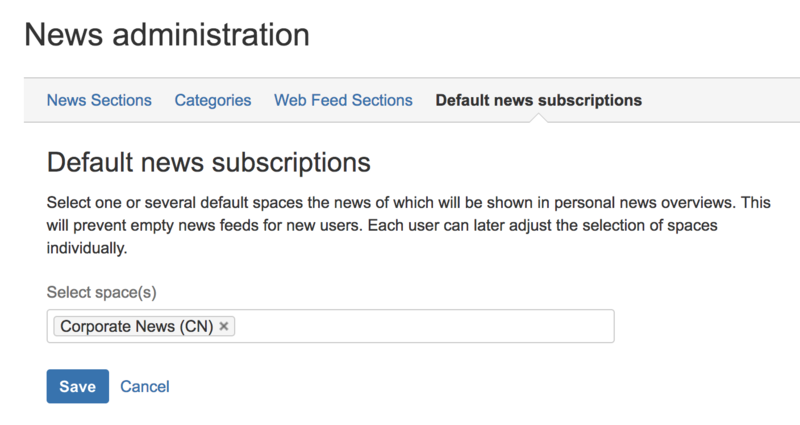 Administrators can now specify spaces to which new users are automatically subscribed as part of their personal news feeds. These could include spaces where you know many employees are active or interested in. Enterprise News Bundle gives your editing team the opportunity to offer new users a completely personalized intranet experience right from the start - including a personal news feed filled with useful information. Users will now see times indicated in their own time zone wherever a timestamp is visible in the Enterprise News Bundle, based on time zone set on their computer, no matter the server is located in the world. The latest version of the Enterprise News Bundle is available on the Atlassian Marketplace: You can see how it works in your Confluence test environment for 30 days free of charge and without obligation. 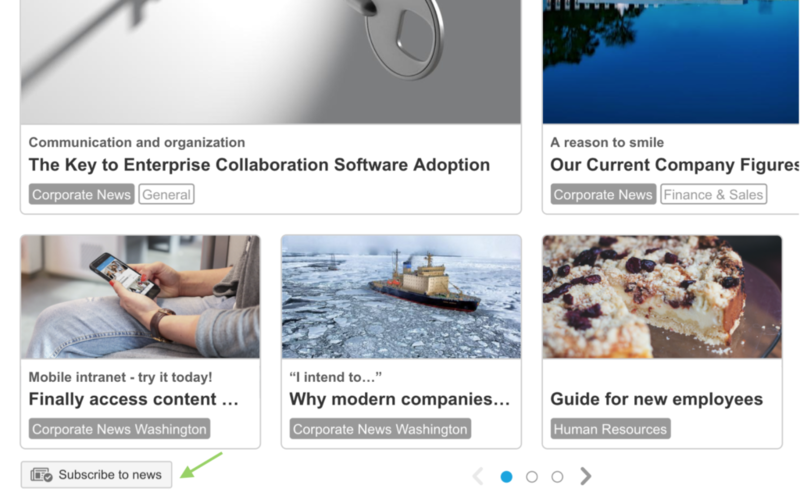 Or perhaps you like to see how the Enterprise News Bundle works in a fully personalizable intranet environment? Test Linchpin now using our fully populated example system or try it for yourself with a demonstration instance!